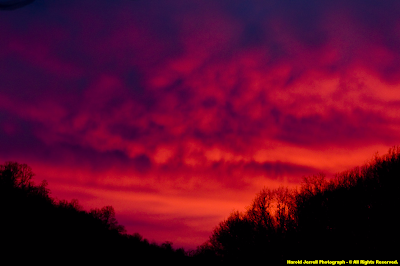 My friend Harold Jerrell captured this blazing RED dawn, a little after 7 AM on January 29, as Mother Nature foreshadowed yet another major winter storm with prophetic glory! Weather charts early on January 29 revealed an organizing winter storm, with an already nasty mixture of frozen precipitation types being spread across the Oklahoma-Missouri borders. Unlike the December 18-19, 2009 MEGA-Disaster event, a much colder, drier air mass won the BATTLE this time to generate a lower density fall of snow. 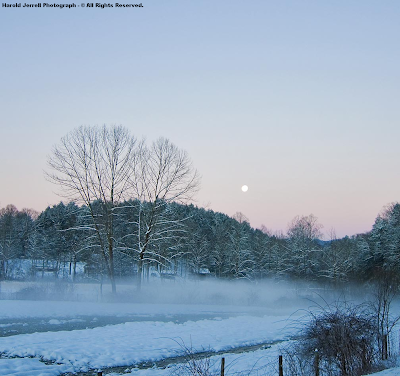 Snow densities did increase, from 13:1 to 10:1 in Clintwood, from late evening of January 29 to predawn hours of January 30. Some power outages were reported in Scott County, Va., with many traffic mishaps across the entire area. Snow accumulation rates became the biggest problem this time, with 1" to 2" per hour being common during the storm climax. My friend Rodney Parsons measured 4" of snow accumulation within only 2 hours in higher elevations of Lee County, Va., as the storm began cranking with intense waves of banded snow. ( compare with Big Stone Gap ). ( TIM ), which becomes orographically forced & anchored by the High Knob Massif on easterly air flow trajectories, could not fully develop during this event since weak to only moderate leeward subsidence was countered by low-level cold air advection on N-NNE wind trajectories to prevent formation of a rain/snow or mixed transition zone ]. 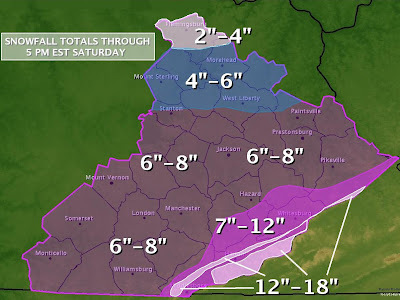 Although snowfall totals ended up a little below MEAN forecast model predictions, a general 6" to 12" of snow depth was deposited from the rugged Virginia-Kentucky border counties eastward across much of the Old Dominion by early hours of January 31. 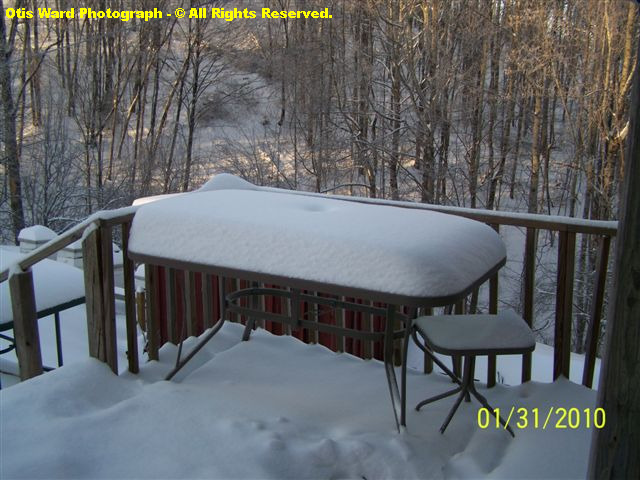 My friends Otis & Nancy Ward submitted a more tame looking photograph at the conclusion of this event with only 9" of snow depth being measured ( around 10" of total snowfall ). 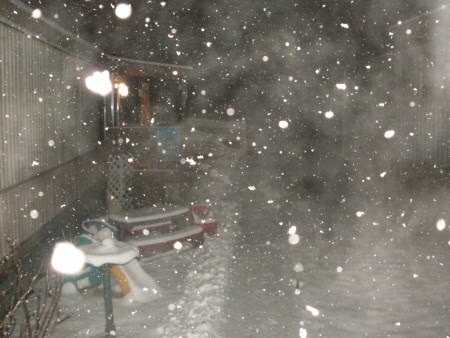 MEGA-Disaster Snowstorm of December 2009 ]. 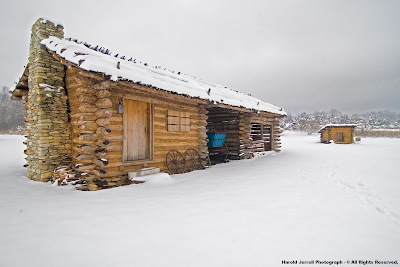 My friends Joe & Darlene Fields, long-time snow observers in the nearby High Chaparral community, measured 10" of total snowfall with also a mean depth that reached around 9" . [ Drifting was, of course, a common feature along the highcountry ridges with given snow depths NOT being associated with drifts ]. 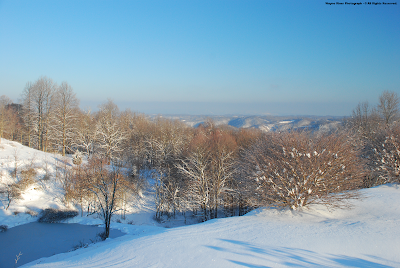 A general 10" to 16"+ of snowfall was common across the High Knob Massif, above 3000 feet, with the heaviest again being measured some 4 to 10 air miles to the west and southwest of the High Chaparral and Robinson Knob communities. January 30 ( prior to 1-2" of new snowfall ). A very similar storm track to the December 2009 Mega-Disaster, but with important mesoscale and upper air variations forced by a different thermal profile in the vertical. 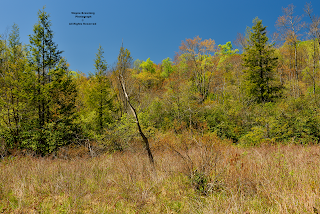 [ The following section will feature many great photographs from across the mountain area, with a large set highlighting wonderful landscapes of Lee County, Va., an important part of the High Knob Landform ( HKL ) ]. A final snowstorm at the end of January 2010 capped off a very active winter period, with some reflections upon the past couple of months not being nearly as gorgeous as those seen in Harold's photograph ( that is for certain )! Even for hardy snow lovers, this has been a rough period thanks mostly to the great December Mega-Disaster. However, it has been notable in other ways as well, with the first 12 days of January having MEAN temperatures only in the teens. [ An average nightly minimum of just 9 degrees in the Norton Valley during January 1-11, with even colder conditions within mid-upper elevation basins of the High Knob highcountry ]. The 49.0" of snow measured at Clintwood 1 W during the December + January period has been the most observed, to this point in a winter, since the record setting 1995-96 season. 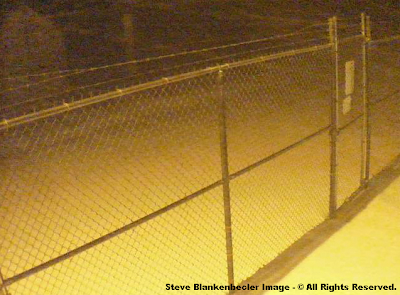 [ A snow depth of 2" or more was observed at Clintwood 1 W for 30 consecutive days, from December 19 through January 17. 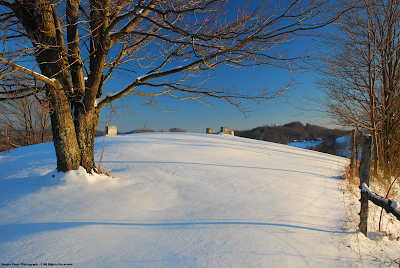 Across northern slopes of the High Knob Massif, 6" or more of snow depth covered the ground from December 19-January 20 ]. greens still grow under the drifted snow." 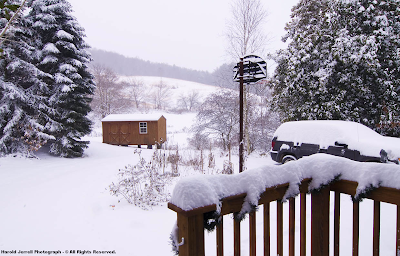 [ Wayne & Genevie Riner measured 51.4" of snow at Nora 4 SSE during the December-January period ]. 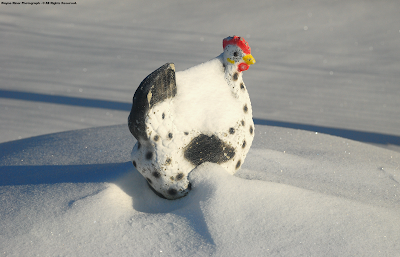 Chicken In The Snow - Should I Go! "The chalk chicken has sat on this rock for several years. After the second major snowstorm, she looks to the warming sun. I wonder if she will be ready to fly south with the Tree Swallows this coming fall." 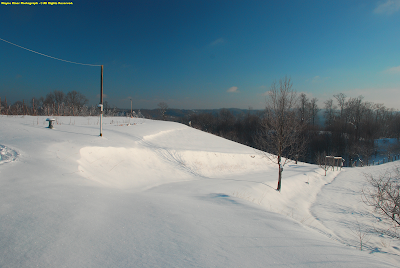 and approximately 94.0" on Eagle Knob. 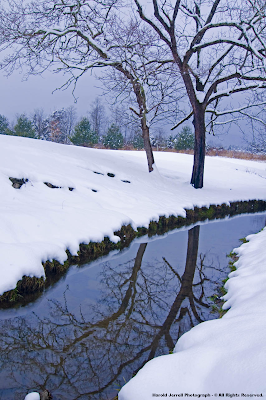 That is the most December + January snowfall observed within the High Knob Massif since the 1997-98 winter. However, if the current winter can catch up to and keep pace with the 1997-98 season it will have to drop an additional 6.5 FEET of snow upon the lofty crestline of Eagle Knob. 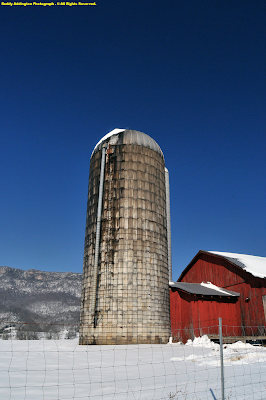 In order to top the 1995-96 season the current winter will have to produce nearly 9 FEET of additional snowfall atop the High Knob Massif. A BIG order to fill, but certainly not impossible with this much winter left! 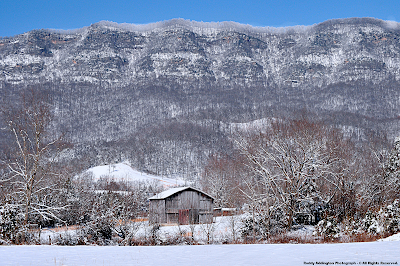 The best snowfall records only extend back into the early 1990s in the High Knob Massif, making one wonder what winters may have been like when legendary Long Hunter's roamed the great, wild landscapes of the High Knob Landform and Upper Tennessee River Basin? The following submitted by my friend Harold Jerrell sheds "some light" on this, from a book written by Robert Kincaid in 1966 titled: The Wilderness Road. The time is Winter 1779-80. 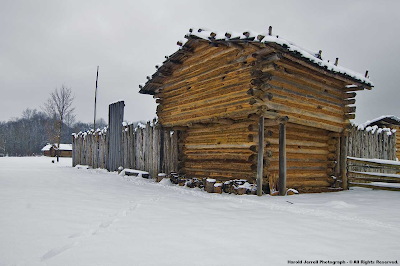 At Boonesborough on Christmas Day he was convinced that the cold was the most severe he had ever experienced in America. The Kentucky River was frozen to a depth of two feet, and the people who endured the hardships of the journey through the wilderness were now all down with colds. 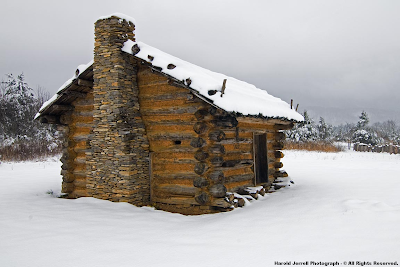 At Logan’s Station on March 20, 1780, Fleming recapitulated some details of the prolonged sub-zero weather. During the inflationary period of Virginia currency, corn was bringing from $100 to $150 a bushel, salt $500 a bushel, and meat was so scarce it could hardly be obtained at any price. The settlers were forced to eat the horses and cattle frozen to death in the fields. More than 500 cattle perished while being brought in over the Wilderness Road. All sections of Kentucky were paralyzed from the middle of November to the latter part of February. Most of the smaller streams froze solid in their beds. Snow and ice continued through the winter, and not a drop of rain fell. Water for drinking, cooking and washing was obtained by melting the snow and ice. In the forests maple trees cracked like pistols and burst open as the sap froze. Through the nights the sleep of the settlers was broken by the frantic struggles of buffalo and other animals. All wild life was almost exterminated. *Cold experienced during the 2009-10 winter season has been NOTHING compared to past times. 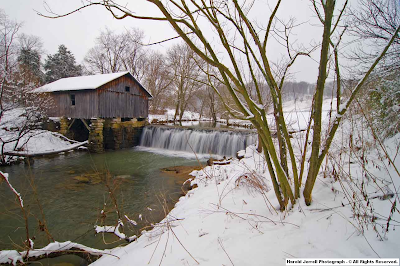 I recall my grandfather, Gilmer Browning, telling of driving a wagon and team of horses onto the frozen Pound River, north of Clintwood, where they would proceed to saw out large blocks of ice to be hauled back and used in town. Likewise, Harold Jerrell can remember his father, and older men in Lee County, telling of many times they crossed the frozen Powell River with horses and wagons. Thanks to my wonderful friend, the late Carl Henderson of Wise, snow measurements started being taken on Eagle Knob of High Knob during work days in the late 1980s. Carl documented some legendary winter storms during the 1980s, such as the great February 1985 blizzard in which a Bell JetRanger Helicopter had to air lift him off the Eagle Knob summit ( amid 1.5 to 10+ feet of snow depth ). ( with general build up over time at his 3235 foot elevation in the Robinson Knob community ). Mean snow depths across northern slopes of the great High Knob Massif topped 4 FEET during that harsh 1970s period, as verified by my friend Steve Blankenbecler who noted trips to the summit, "were like driving through a tunnel." [ Close inspection of the above photograph reveals a home, sitting beside a winding dirt road in the distance, perched upon plunging mountain slopes that twist around an array of deep, shady hollows. 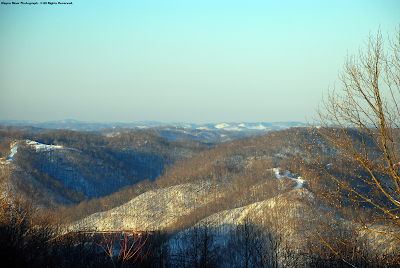 Such is the rugged character of terrain across most of Dickenson, Wise, and Buchanan counties ]. "There was an Air Force jet that crashed on Beartown in the winter of 1977. A friend was on the State Police force at the time and participated in the recovery. 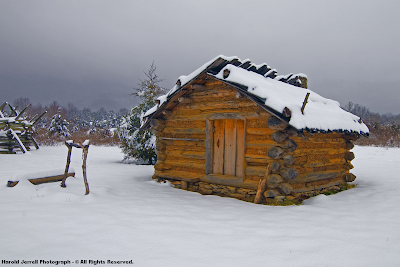 According to him, snow was waist to chest deep up there at the time." 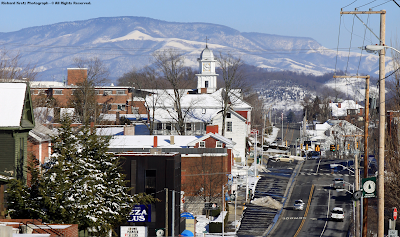 Since early 1990s the deepest MEAN snow depth upon the High Knob Massif reached 58" during the great blizzard of March 12-14, 1993. Snow drifts of more than 20 FEET were well documented, with VDOT and rescue crews having to employ D9 Dozers and Logging Skidders to reach a group of individuals stranded within the crest zone of the massif. 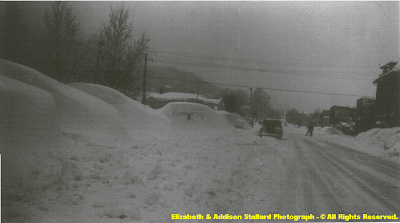 Among the greatest snow depths observed during the past 70 years likely occurred amid the awesome snowstorm of March 1942, when depths of 3 to 4.2 FEET were measured within lower and middle elevations from Powell Valley to Norton, Wise, Pound, and Clintwood ( along and north of the High Knob Massif ). Elizabeth & Addison Stallard Photo - © All Rights Reserved. While no records exist for the High Knob highcountry, it is very likely that depths eclipsed those observed during March 1993 since they did just that across lower elevations! 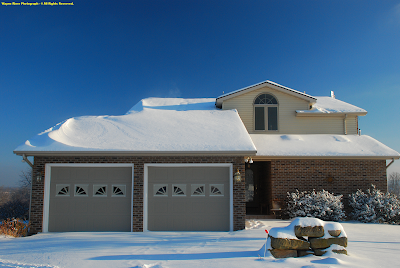 [ Note how winds drifted and swirled snow across the roof of the beautiful Riner home, site of official Nora 4 SSE NWS Cooperative Station, during the January 29-30 snowstorm ]. Countless other examples could be cited from my extensive climatology of great snow events of the past to place perspective upon the present 2009-10 season ( up to this point only ). 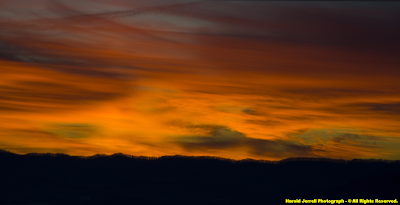 A season which is FAR, VERY FAR, from being over, as confirmed by both forecast models and my photographic friend Harold Jerrell...with yet ANOTHER gorgeous RED, and this time GREEN, sky over Lee County at the dawn of February 2010! I'm afraid it is not a scene of tranquility! I'm looking for help trying to locate a picture or information on an old welcome sign or billboard dated back (1960's) when we first moved from the hills of East Tennessee that had a freckled face boy with fishing rod welcoming you to Tennessee... He was a young boy I believe with redish hair and coverall on? Do you know the sing and where I could possibly get a copy of it?